The second part of a series of computer animations. The series MOMENTUM~ deals on one hand with spaces refracted by textures and on the other with a projection of them, their temporality and afterimages which can be seen within a frame of 30fps by switching between two states of spatial folding. Like a holodeck with 30Hz. One could also say that the state switches from a two-dimensional surface or line to a three-dimensional space and back. Depending on the frequency, the space becomes perceptible or changes the movement and thus projects itself into the black empty space. The frequency has a size of 30 frames per second... That means the state of two to three dimensionality can switch between once and thirty times. This happens at the same time with several surfaces that together form an architecture which in turn is the starting point. These surfaces consist of lines whose number is controlled and thus influences also as a factor in the refraction or folding of the room. Spaces of space occur which are superimposed within the architecture again as spaces in the space or projections of different spaces that overlap. So it´s about a kind of frequency of the architecture and the momentum of the projection of what the programmed temporality creates. Or the momentum of a radical spatial state. The camera has the task to observe the events and to move through the architecture to understand them and is supposed to create a sort of narration through its movement, which in turn creates something disturbing and frightening in this extremely radical and chaotic state of space. Similar to the camera, the light source moves more or less randomly and additionally creates a factor in the perception of the spaces and their dimensionality. So far the sound is technically not connected or synchronized with the moving picture. 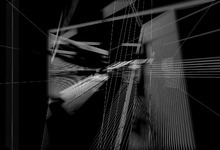 It is a digital composition that was produced for this work.